It was hot and sunny. The sun was burning the town and people. The buildings of red bricks seemed like they on fire. The cars were running at high speed, blowing smoke in front of me. I was standing at the crosswalk waiting for the light to turn green. "Mom, Look up at that. What 's that circle up there?" I looked up to where he pointed in the sky. 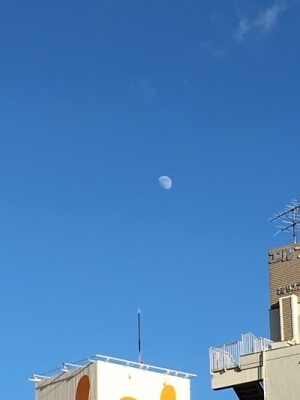 The daytime moon was high above the tall buildings with heated walls. The light gray face of the moon looked tired and sad. The moon was waiting for the perfect moment to shine. It sat patiently across from the sultry sun until the right moment came around. You 'll never find a rainbow if you're looking down.